Hoo! the owl is watching you! This striking acrylic painting by Natalie Knowles joins her growing menagerie of animal portraits. 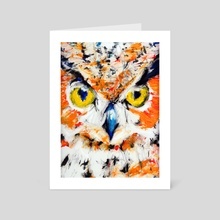 An owl is not just for Halloween twit-twooo!! !